The BrandZ™ Top 30 Most Valuable South African Brands report, released by WPP and Kantar Millward Brown, reveals that the top 30 South African brands show more potential for global growth than their counterparts in the Chinese and European rankings, but have less exposure to overseas markets. 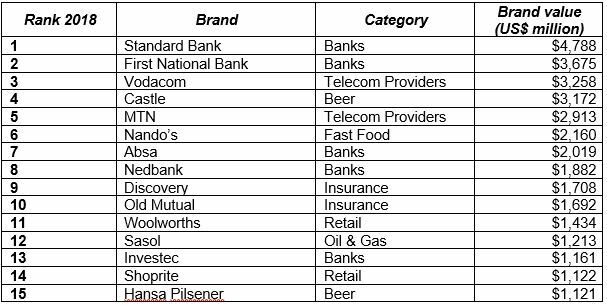 Standard Bank, with a brand value of $4.79-billion, is South Africa’s number one brand in the first BrandZ™ Top 30 Most Valuable South African Brands ranking. With a combined value of $42.6-billion, the ranking covers several industry categories, including banks, telecommunications providers, retail, insurance, fast food, beer, hospitals, oil and gas, entertainment and airlines. The ranking aims to reflect the brand touch points of consumers’ daily lives in South Africa. According to the report, the region is fast becoming a rewarding place to do business, and the ranking flags the potential for brands to grow locally and globally. However, brands will need to work hard to stand out from competitors in a digital landscape in which offerings are increasingly homogenised. The report highlights that the future winners will be those who are able to differentiate themselves in a meaningful way, which will enable them to deliver superior shareholder value. “Its strengths and diversity are reflected in the ranking, as leading brands across a range of categories demonstrate their ability to innovate and make a difference to consumers’ lives,” adds Roth. The report shows that South Africa’s most valuable brands do well in delivering functional communication strategies, based on utility and price; however, they are less successful at engaging with consumers on an emotional level. As brands look to increase their value and the ROI on their marketing efforts, tapping into this emotional connection with their customers will help them compete with global brands who are more experienced. South African brands, therefore, need to build in an emotional differentiator, as functionality alone is not necessarily sustainable for long-term growth. Other trends highlighted in the report can be found below. Brands need to be meaningful and make a difference to consumers by meeting their functional and emotional needs to create affinity; they need to create a difference by being perceived as distinctive, giving them a competitive edge. The most meaningfully different South African brands are Woolworths, Dis-Chem, Nando’s and Clicks. These brands are differentiating themselves by driving strong brand purpose, a unique brand experience and then amplifying this through great market communication. Collectively, the BrandZ™ top 30 brands are more meaningfully different than the national average; however, South Africa’s top 30 differentiation metrics rank below average relative to their worldwide counterparts. Brands that are perceived as creative by consumers capture interest and grow more than competitors who are perceived as unimaginative and dull. Nando’s clever and controversial advertising campaigns are good examples of how a brand can communicate effectively with its target audience, in a real and relevant way. Many of the country’s brands, including those in the more traditional categories like banks, retail and telecommunications providers, have adopted technological disruption to distinguish themselves from competitors. Examples include First National Bank’s ‘open a bank account with a selfie’ and Capitec’s biometric security. Up-and-coming brands are also using technology to disrupt, with Takealot purchasing Mr Delivery, and Showmax partnering with DStv. The BrandZ™ Top 30 Most Valuable South African Brands report and ranking, as well as other brand insights for key regions of the world and 17 market sectors, are available online here. The reports, rankings, charts, articles and more can also be accessed through the BrandZ™ app, which is free to download for Apple IOS and all Android devices from www.brandz.com/mobile or by searching for BrandZ™ in the iTunes or Google Play app stores. For more information, visit www.brandz.com. You can also follow BrandZ™ on Twitter.